The most compact, lightweight, and affordable 4 mobile printer ever. Leasing Available from $9.87 per month! Leasing Available from $25.24 per month! 92147-New P3 On A Fieldpro Rt43 Wifi W/Mcr. Leasing Available from $25.22 per month! This is the most compact, lightweight and affordable 4 mobile printer ever. It's the first advanced printer designed specifically for Mobile Sales, Field Service and Public Safety perfect for all 3 or 4 receipt, work order, and ticket printing needs. FieldPro is packed with features and options like our exclusive Universal Port, printer emulations for drop-in integration, and wireless Bluetooth and Wi-Fi versions. Every FieldPro printer is backed by decades of experience and PrintekMobile's renowned customer service. 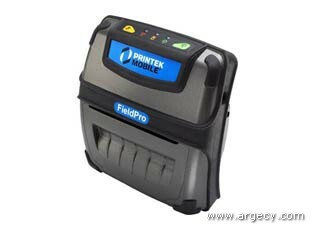 PrintekMobile FieldPro printers are great for when workers need to stay focused on their job, not their printers. That's why the FieldPro is engineered to create crisp, professional-looking citations, field service, and field sales documents automatically and reliably. One look will convince you FieldPro takes mobility and ease of use to a whole new level. FieldPro printers are up to 10% smaller and 40% lighter than competitive models. Even so, these rugged printers are packed with advanced features to help your mobile workforce become more productive. Features like the easy-to-read control face and drop-in paper loading make day-to-day use a pleasant experience. Our IP54 rating and ability to stand repeated 4-foot drops to concrete help insure the printer stays in the field, not in for repair. If equipped with an optional 3-track Magnetic Card Reader your workers can capture credit card or drivers license information automatically, speeding transactions and increasing accuracy. As every person who owns any sort of mobile device knows, battery life is incredibly important. That is why we have engineered FieldPro with the best power management system of any mobile printer. Full shift performance is virtually guaranteed, even in demanding wireless applications. More typical is multiple shift performance on a single battery charge. To make things even more flexible we have made this printer capable of operating while the battery is charging or operating from an external power source such as a vehicle power adapter without a battery installed. To top it all off we have included a PrintekMobile exclusive feature called the Universal Port. This port carries both data and power and will allow integration of optional external devices such as bar code scanners or signature capture pads without the cost and maintenance of additional batteries and wireless radios. And all this is compatible with the mobile host of your choice from fully ruggedized handhelds, laptops, and tablet computers to data-enabled phones. Fonts: A wide range of font types and sizes, from ~ 6 cpi to 34 cpi depending on emulation chosen, plus scaling. Bar Codes: 39, 128, Intlv 2 of 5, CODABAR, EAN08 & 13, PDF-417 and UPC, depending on emulation chosen. Downloadable fonts, graphics, logos and additional bar codes. Software Available: Drivers for WIN 98, 2000, XP, Windows CE/Pocket PC, Windows Mobile, and Palm OS print utilities and SDKs. Remote Printer Setup Program provides convenient configuration via a Windows interface from any computer. Emulations: Emulates many popular printer brands (O'Neil, Zebra CPCL and ZPL, and Printek Mt3). Can be upgraded as new emulations become available. Battery: Rechargeable 2 cell Lithium Ion, (7.4 V, 2200mAH). Endurance: Over 3,500 printed inches per charge. 3 LED indicators for general fault, wireless connection/power and battery status indication. Buttons for Power and Paper Feed. Sensors for paper out, black mark detection, and door open. 2 MB Flash, 1MB SRAM. Standard memory supports large and graphic intensive print jobs. One-year printer warranty on the entire printer case, battery, and print head included.